Yesterday (Saturday 30 January), Serena Williams played in her seventh Australian Open final. She had not only won all six of her previous final appearances, but she had the opportunity to win more Australian Open titles than anyone in history. Having failed to win the US Open last year, and hence just miss out on the Grand Slam, Serena had looked very impressive in her previous rounds. But, she was denied her 22nd Major title (which would have equalled Steffi Graf’s record) by a relatively unknown German by the name of Angelique Kerber. It could not have started worse for Kerber, she lost the first seven points in the opening two games, but quickly turned things around and went on to win the first set 6-4. Serena won the second set 6-3, and in a tight third set it went all the way to a tense tenth game, which Kerber won to win the match and the championship. With this year being an Olympic year, people were even talking of Serena winning a Grand Slam plus the Olympics, a “super Slam” maybe? But, with the Australian Open now lost, Serena clearly cannot now do that. However, it was nice to see her smiling in defeat. I suspect that the pressure she put on herself last year as the possibility of a Grand Slam progressed has now been replaced with a feeling of “if I stay fit, I will surpass Steffi, so why sweat it?”. Which is my feeling. She looks as fit as ever at 34, and if she does not injure herself there is no reason why she cannot play this year, next year and, who knows, maybe even into 2018. Surely, with 4 Majors every year, it is just a matter of time before she wins her 22nd, 23rd, 24th and…… who knows? At number 16 in Rolling Stone Magazine’s list of the 100 greatest songwriters is Leonard Cohen. Cohen was born in Montreal, Canada, in 1934. He was raised in a middle-class religious Jewish family; his maternal grandfather was a Rabi, his father Nathan Cohen died when Cohen was 9 years old. The part of Montreal in which he grew up was an English speaking part of this predominantly French-speaking city, and so one can say that Cohen grew up as a minority within a minority; an English-speaking Jewish boy in a predominantly French-speaking Catholic city. I have always held that this perception of himself as an “outsider” has influenced much of Cohen’s work. Before becoming a songwriter, Cohen was a published poet. His first album of songs was Songs of Leonard Cohen, which was released in 1967. By this time, he had already published four books of poems; this poetic style is clearly visible in many of his song lyrics. I am a huge fan of Cohen, personally I would place him in my top five of the greatest songwriters. In terms of his lyrics, he is, in my opinion, up there with the likes of Bob Dylan and Paul Simon. Like Dylan and Simon, he has elevated “pop songs” to sheer poetry. At number 16 in Rolling Stone Magazine’s list of the 100 greatest songwriters of all time is Leonard Cohen. There are so many Cohen songs that I could have shared in this blogpost. I have already posted several Cohen songs, “Famous Blue Raincoat” here, “So Long Marianne” here and “The Partisan” here. The song I have decided to share today is possibly less well known; it is “The Guests”, a song which appears as the opening track on his 1979 album Recent Songs. This song illustrates many aspects typical of Cohen’s songs, including the evocative and complex lyrics, as well as another hallmark of Cohen’s songs which is his deep voice being accompanied by female voices, something I find quite enchanting. At number 31 in Rolling Stone Magazine’s list of the 100 greatest Beatles songs is “You’ve Got to Hide Your Love Away”. This John Lennon-composed song was recorded in February of 1965 and released in August of the same year as the third track on their album Help. It is one of my favourite Beatles songs from this period, with wonderful lyrics and melody; it is just perfect. Ostensibly “You’ve Got to Hide Your Love Away” is a song aimed at a (presumably fictitious) girl who has left the singer; leaving him devastated. But, it is often thought that the song was, in fact, aimed at the Beatles manager Brian Epstein, who was gay at a time when it was illegal in England to be homosexual. Lennon and the other Beatles knew of Epstein’s homosexuality, and knew that he had to hide it or else he could be arrested and imprisoned. At number 31 in Rolling Stone Magazine’s list of the 100 greatest Beatles songs is “You’ve Got to Hide Your Love Away”. 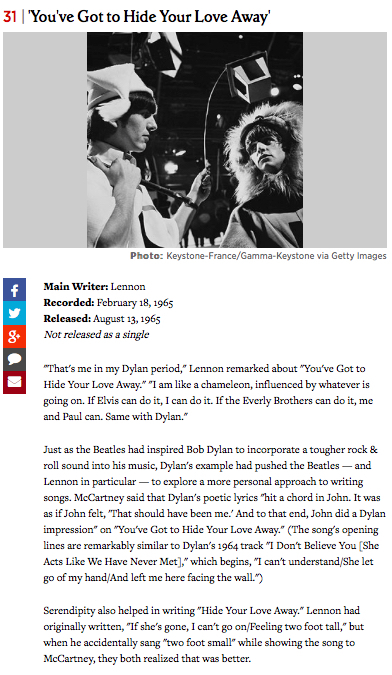 The song was written when Lennon was in his “Dylan period” (as he later called it). If you look at photographs of him at this time, he was often seen wearing a felt cap just like the one Dylan wears on the cover of his 1962 debut album Bob Dylan. Unfortunately, presumably for copyright reasons, I cannot find a video of “You’ve Got to Hide Your Love Away” on Youtube. However, I have found it on DailyMotion, but I am not sure how long the link will work. This is the song as it appears in the movie Help! At number 17 in Rolling Stone Magazine’s list of the 100 greatest songwriters is Neil Young. Young was born in 1945 in Toronto, Canada. I first came across him on the 1970 album Déjà Vu as one of Crosby, Stills, Nash and Young. This was before I knew that he had previously been in Buffalo Springfield with Stephen Stills, or that Crosby, Stills and Nash had released an album before being briefly joined by Young. I have blogged about Buffalo Springfield’s 1967 song “For What It’s Worth” here, and there are several songs on Déjà Vu which I like a great deal, but my favourite Neil Young work are his two solo albums After the Gold Rush and Harvest. I adore these two albums, I think both are masterpieces. At number 17 in Rolling Stone Magazine’s list of the 100 greatest songwriters of all time is Neil Young. The song I have decided to share in this blogpost is “Heart of Gold”, which is one of my favourite Neil Young songs. It is from his 1972 album Harvest. That keep me searching for a heart of gold.And I’m getting old. Here is a video of this wonderful song. Enjoy! On Saturday (16 January) the Ospreys fought back from a half-time deficit to win against Clermont Auvergne and go top of their group in the European Champions Cup (the replacement to the Heineken Cup). In the revamped European club competition, only two Welsh regions are competing this season, and the Scarlets are languishing at the bottom of their group. The second half saw the Ospreys shut out Clermont Auvergne, scoring 15 unanswered points. They had gone into half time 13-6 down, but in a remarkable second half turnaround they managed to stop Clermont Auvergne in their tracks and score 15 points to make them comfortable winners. What is even more remarkable is that those 15 unanswered points did not come from Dan Biggar, who has grown in the last 2 seasons to become one of the most accomplished outside halves in world rugby. Rather, after he hobbled off with a dead leg, the points were made by replacement Sam Davies. There now remains one game in the group stages, on the 24th of January the Ospreys will take on Exeter away. If they win that game they will qualify for the knockout stages of the European rugby competition for the first time in 6 seasons. With the 6 Nations on the horizon, this will be a welcome boost to the confidence of the numerous players who are also in the Wales national squad.